The artificial intelligence backed Google Assistant can now take commands in Hindi as well. While the functionality is basic only, we expect the company to expand it as much as the English commands. For now, you can ask the weather and basic questions in Hindi. Google Assistant comes as a default voice assistant on Android smartphones. While some are offering Alexa too, the majority sticks with Google’s assistant. 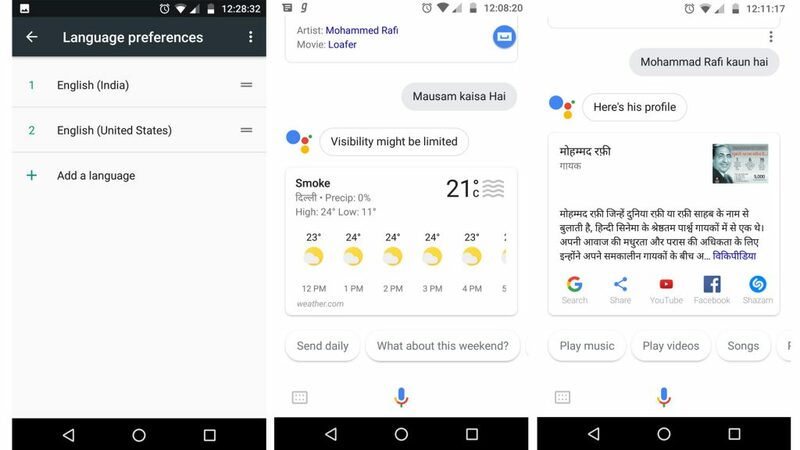 This time Google has silently rolled out the basic Hindi commands for Android smartphones, after introducing Hindi voice support for the JioPhone last year. For the uninitiated, Google Assistant is an artificial intelligence based function on Android phones. It accepts voice commands and performs the tasks you request. For example, You can ask ‘What is the temperature today?’ and the assistant will reply with the weather forecast. Now, Google has added Hindi support to it. So you can make commands in Hindi such as ‘Mohammad Rafi Kaun Hai’ and ‘Aaj ka Mausam/Mausam kaisa rahega.’ These being the basic commands, we still spotted some glitches in the Hindi Assistant as it cannot tell jokes in Hindi as it does in English. Other advanced commands are also not available yet. While these are just basic commands, you can still set up Google Assistant in Hindi as a default. It allows you to use English as well as Hindi languages for voice search which is good. You can easily set up Google Assistant in Hindi in these few easy steps. First, go to Settings > Languages & input > Languages. Here, tap on the ‘+ Add Language’ button and add ‘English (India)’ as a language. Now drag ‘English (India)’ to the top of the list and make it the first language of your device. Immediately after these steps, you can easily give commands to your Google Assistant in Hindi.